Although independent lumber producer Kalesnikoff Lumber started a major sawmill upgrade this past fall, the project has actually been a few years in the works, both in planning and purchasing equipment. “We started working on planning the upgrade quite a while ago,” explains company president Ken Kalesnikoff. Ken Kalesnikoff is the third generation of the Kalesnikoff family to run the specialty lumber company, located in the small town of Thrums, midway between the towns of Nelson and Castlegar, in southeastern B.C. The downturn, though it was severe, gave Ken Kalesnikoff and the senior management team at Kalesnikoff Lumber—Ken’s daughter and the company’s chief financial officer, Krystle Seed, his son and operations manager, Chris Kalesnikoff, and sales and marketing manager Griffin Augustin—the time to more fully develop and plan the upgrade. “We spent more time thinking about what we wanted to do, what we wanted the mill to look like after the upgrade, and it gave us more time to assess things so that when the market did turn around, we were able to put something together quickly,” says Ken. 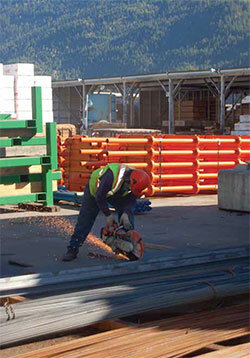 Speed and efficiency are certainly important, but unlike most other sawmills in the B.C. 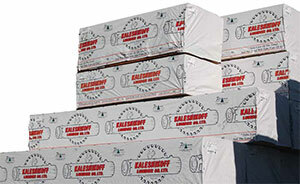 Interior, speed is not the primary focus for Kalesnikoff Lumber. Recovery is just as important. Kalesnikoff Lumber is focused on optimizing speed and recovery, with the ultimate goal on flexibility, to enable the company to continue serving the niche markets that they target. The company manufactures lumber using what is known as the Kootenay Mix of timber that grows in this part of the province, which includes a wide variety of coniferous tree species. While they have a strong focus on Douglas Fir, they also do production runs using Lodgepole Pine to Western Larch. With this kind of timber mix, this region of B.C. has been largely unaffected by the mountain pine beetle which has had a huge impact on the timber resource in the Central Interior area of the province. Right through the fall and early winter, the sawmill site at Kalesnikoff Lumber has been a busy place. This past fall, the company contracted Woodland, Washington-based USNR for equipment related to the sawmill modernization. The new equipment includes a primary breakdown line comprised of a quad arbor sawbox, vertical double arbor gang, TriCam scanning, MillExpert optimization and PLC control system. The modifications ordered for the edger line include retrofits to the existing edger, upgrading the transverse scanning system with USNR’s BioLuma 2900L sensors, MillExpert edger optimization and PLC controls. The trim/sort line modifications include two radius back unscramblers, a lug loader, Multi-Track Fence, 70-bin pusher lug sorter top and sort bin modifications, along with USNR’s WinTally sorter management, MillTrak lumber flow monitoring, MillExpert trimmer optimization and PLC control system. 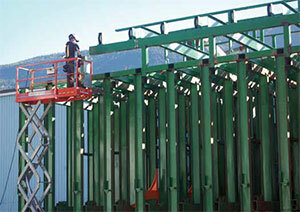 Ridgemill Design of Kelowna provided mechanical and structural detailed design. 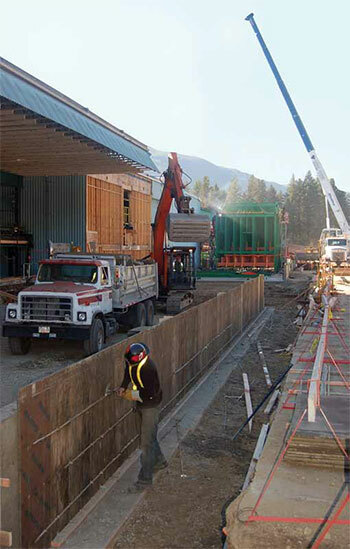 Timber Line Mill Construction was the main mechanical contractor, and Martech Electrical Systems was the main electrical contractor on the project. Hollins Industries did the lumber transfers and log decks, and New West Industries did the residual conveyors. Arrow Speed Controls supplied all the variable frequency drives. Willy Kalesnikoff has managed all of the onsite construction activities and used equipment rebuilds. Kalesnikoff Lumber has been working with mill consultant Lloyd Pederson, of Kelowna-based Pederson Management, on the planning, design and execution of the project. “We had some good discussions about the company and the sawmill, what we do and make, and then we sat down with Lloyd and put pen to paper to focus on the markets and the species, and the volume we are going to have for logs,” says company chief financial officer Krystle Seed. Overall, the project is expected to provide Kalesnikoff Lumber with high-speed flexibility to further expand its range of products and markets, and improve recovery. And that flexibility will allow it to, for the most part, complement, rather than compete with, other sawmills in the B.C. Interior, and in the market. That is the role, and market segment they see themselves playing, with the major lumber producers in the B.C. Interior. “We’re not going against the major lumber producers,” says sales and marketing manager Griffin Augustin. “We’re going to be working with them in meeting the needs of the market, rather than against them. 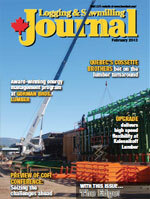 “Most interior sawmills run a small diameter log, focusing on the domestic 2x4/2x6 markets. We are targeting niche markets, developing products that can be cut from a wide range of log parameters (shape/size) which will be critical for our success,” he says. With the upgrade, the diameter of the wood handled on their small log line is going to increase—rather than decrease. Parts of the upgrade were just plain necessary to remain efficient and bring the mill up to 2013 mill standards, says operations manager Chris Kalesnikoff. “From a production standpoint, we knew we needed to improve on our recoveries—we have a limited timber supply here. “And from the production side, there were labour challenges to deal with. Over time, it’s been difficult to find people to commit to the entry level work that we have. We have been intensive on manual labour at the mill, and that has created turnover for us. And when you have turnover, it requires a lot of time to train people to make sure they are up to speed on safety, and safe work practices. being resourceful and getting more for their capital expenditure dollars. On the iron side, Ken noted that they have worked away in recent years at acquiring some used equipment. “The project is a combination of things that we have purchased, such as the bin sorter, and new equipment. We saved ourselves some money by doing that. The headrig has continued to operate right through the construction and upgrade. “We’ve been able to juggle—we’ve got a pretty patient group of guys, and everybody has stepped up,” says Chris Kalesnikoff. “Between our production people and maintenance, we’ve been able to alter flow lines and not significantly impact throughput at the sawmill.” Chris added that the company is particularly grateful to their employees for their contribution to making the upgrade project a success. Pederson worked closely with Kalesnikoff management in developing the conceptual design for the upgrade. He has managed the upgrade program, doing the engineering, purchasing the equipment and hiring the contractors. “It’s been a tight budget and a tight construction schedule, but it’s gone pretty good,” he says. He noted that the project involves challenges because it is a meshing of new equipment and used equipment. “With the used 70 bin sorter, which was designed for 26 foot lumber, we had to cut ten feet out of each bin wall so it handles 16 foot lumber, and put it back together again, and then convert it from a J-bar to a pusher top from USNR. And we incorporated a used USNR board edger. “It’s a challenge, making sure it all fits together and works well. With all-new equipment, there are engineering drawings from the manufacturer that has everything working together, from start to finish. With this project, we had to make sure that the used equipment meshes with the new equipment, and, with things like the bin sorter, modifying the used equipment before tying it in with other used or new equipment.” This added a lot of extra work to Willy Kalesnikoff’s activities in managing and coordinating the site construction. It’s a lot more demanding—and interesting—than a straight new installation where basically all the mill equipment comes off a truck and is set in place, Pederson says. By incorporating used equipment, Kalesnikoff Lumber is being resourceful and getting more for their capital expenditure dollars. “With these kind of projects,” says Pederson, “you look at the cost of something and the return on investment it is going to deliver. That dictates how much money can be spent. With the Kalesnikoff project, the initial big task was to develop a plan that provided the gains in recovery we needed at an affordable price.” And all those involved with the project believe those gains will come to fruition as the new equipment is fully utilized in 2013. In terms of employing both new and used equipment with the upgrade, that’s really just part of a tradition at Kalesnikoff Lumber, of making the most of what they have. Getting the most out of the timber is part of an approach to being resourceful and sustainable at Kalesnikoff Lumber. The company wants to make sure it is part of an overall philosophy of getting the right log to the right mill, and thus making the most of the resource itself.